A section on leading FMCG companies and brands (such as Coke, P&G, Unilever, Nestle, L'Oreal etc. ), their marketing and branding strategies in the western markets (USA, Western Europe: UK, France, Germany and others). 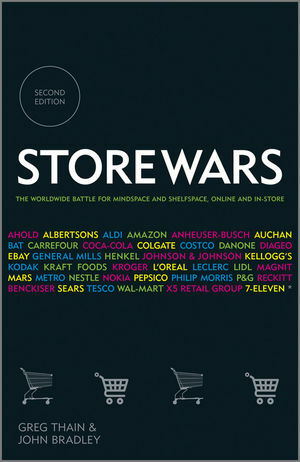 A section on leading retailers (Wal-Mart, Tesco, Carrefour etc. ), their developments and expansion over the last 10 years. A section describing the interaction between retailers and manufacturers, including competition for end-consumers, trade marketing. A section covering the Emerging Markets—the retail landscape in the major developing economies, results of the expansion of major FMCG brands and western retail chains, challenges related to distribution and FMCG marketing in those countries. The book will also discuss the impact of the Global Crisis on the consumer and retail markets as well as predictions and prospects for the future. Greg Thain has been Chairman / CEO of marketing, trade marketing, Internet, consultancy, PR and research companies, in the UK & emerging markets. Having over the last 20 years owned or managed businesses in Russia, India, China, Turkey, Hungary, Romania, Greece, Ukraine, Sweden and Kazakhstan, working for many of the leading international FMCG and retail businesses. Currently adjunct professor of marketing & E-Commerce at the International Monaco University (IUM), and Chairman of the Storewars marketing business. He lives between Monaco & Moscow. John Bradley held international marketing positions in Cadbury for 24 years before becoming a consultant and writer. His first book, Cadbury’s Purple Reign, was published in 2008 and John is a regular commentator on the FMCG world in his adopted home country of Canada and the USA. John is currently working on his next book, again jointly with Greg, on the world’s leading consumer marketing companies; provisionally entitled, The Mega-Consumer Companies, scheduled to be published April 2013.